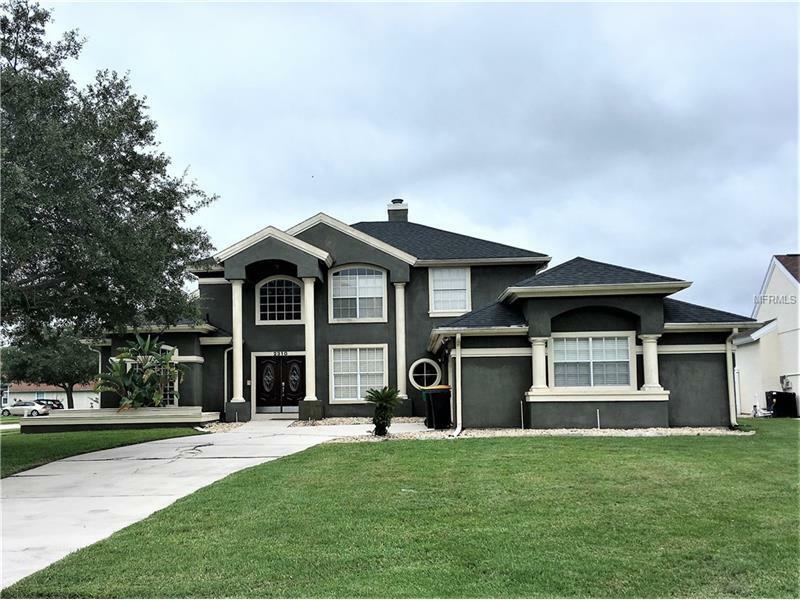 Magnificent 4-bedroom 2.5-bath located close to Disney, Universal, Sea World and everything Orlando has to offer! Tiled entry with sweeping staircase to the left, formal dining room to the right. Straight ahead is the living room with 19 ft high ceiling and extra-wide sliding doors to the pool and deck. There is a double-sided fireplace facing the living room and family room. The kitchen has granite counters, black appliances, plenty of dark wood cabinetry, and is open to the breakfast nook and family room. The breakfast nook has a sliding door to the pool deck. Also by the kitchen is a half-bath, convenient to pool guests. The two-car garage is carpeted and serves as a game room. The master suite is downstairs, featuring a large bedroom with sliding door to the heated pool (think moonlight swim! ), large closet, and en suite bath to die for! Jetted soaking tub, separate tile-top vanities, step-in glass shower and private water closet room. Up the wide staircase is a balcony to view the living room, and the three bedrooms share the full upstairs bath. The pool and deck are screen-enclosed, to enjoy all the seasons. The portable hot tub is included in the sale. Central vacuum system, intercom, new roof in 2015, newer AC system. Furnishings are negotiable. Property is zoned for short-term rentals, so let this home make money for you when you canât be here to enjoy it!